17 hands of power, majesty, yet so gentle. Click here for his pedigree. Ivanhoe has large clean bones, very correct legs and the best feet you could ask for on any horse. 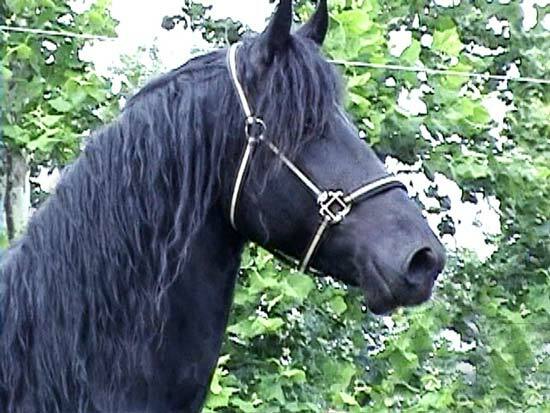 Big and beautiful, he has abundance of feathers, mane and tail, and the wonderful gentle disposition Friesians are known for. Even as big as he is, anyone can handle this stallion. His first foals were born in 2013, they exceeded all expectations; His foals this year are just as spectacular. Ivanhoe is registered with both the Dutch Friesian Registry in Holland and also with the German Registry. His sire, Ceimpe is German and very "old world" baroque; His beautiful dam Jaleta is Dutch and the modern sport type. As you can see from his video, Ivanhoe got the best of both worlds. We do not stand our stallions to ourside mares but only breed our own. We do have foals for sale by Ivanhoe. For a list of his available foals please email us at flyingw@bright.net or phone 740-493-2401.